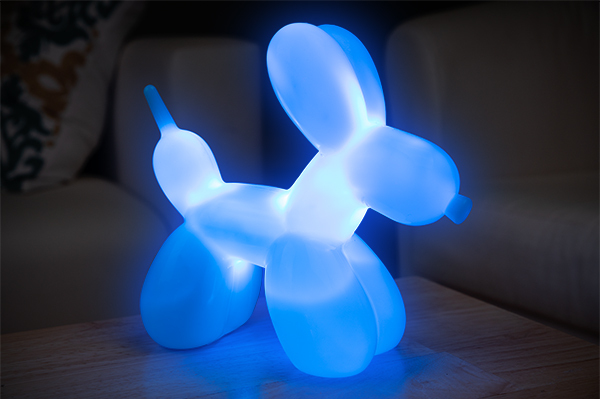 Balloon Dog Light: Adorable light shaped like a balloon animal. 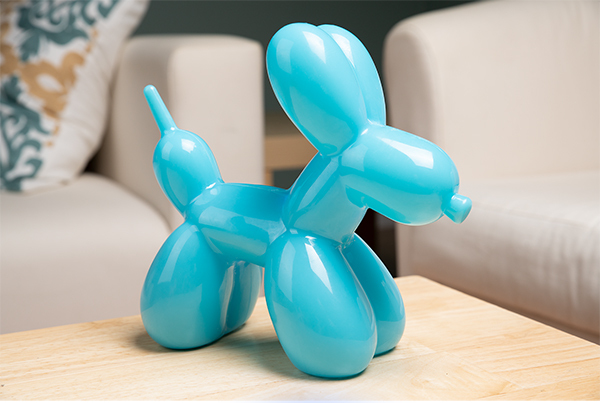 The Balloon Dog Light is an ambient lamp that makes an adorable addition to any room. The soft (but durable) silicone mimics the puffy look of the inflated animals it's modeled after. 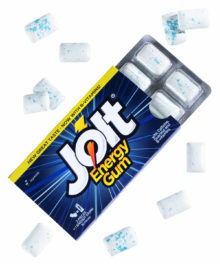 Instead of being filled with air or helium, the interior has the gentle glow of the colored LED inside. Squeeze the animal’s back-left leg to turn the light on and off. 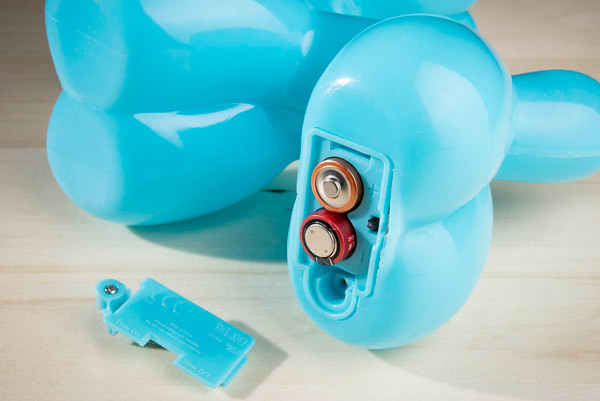 You can also use the sleep timer if you don’t want to worry about manually turning it off later; the 30 minute automatic shut-off makes it ideal for a uniquely cute nightlight. It’s like having your own personal balloon animal (without worrying about popping, deflation, or being freaked out by a clown). 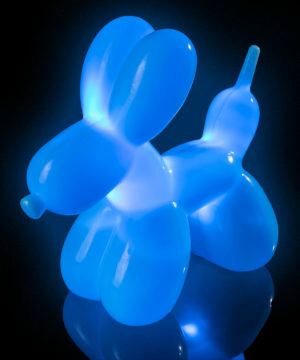 The Balloon Dog Light is a fun mimic of the inflatable souvenir, from its pointed tail to its tied-off nose. The carnival aesthetic remains intact with a cleverly hidden power switch embedded in the pup’s back-left leg. Just squeeze the leg to turn the light on and off (which is a lot more fun than a switch anyway). After carefully combing through social media, we’ve found that people like posting pictures of their adorable dogs much more than their living room lamps. 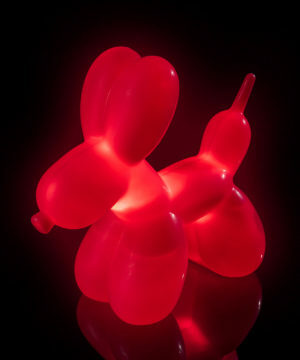 But the Balloon Dog Light doubles as an ambient light in the darkness and a cute decoration in the light, making it instantly post-worthy. The puffy features and small stature ensure you’ll want to display this light no matter the dimness. Bedtime can be a circus, but this light helps make the nightly transition a little easier. The Balloon Dog Light’s sleep timer function is a great way to gently acclimate your little one to the darkness. Flip the button to turn on sleep mode and the soft light will automatically turn off after 30 minutes, which should be plenty of time to drift off to a carnival of dreams. Features a cordless design and 30 minute sleep timer. 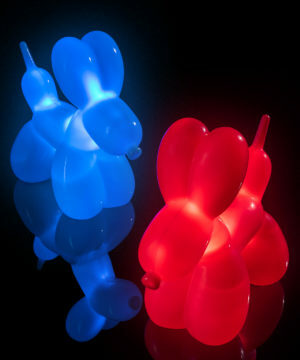 The Balloon Dog Light is available in both red and blue. 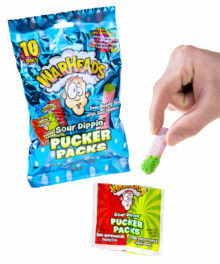 Although replicating an easily poppable toy, both models feature a hard silicone rubber exterior. 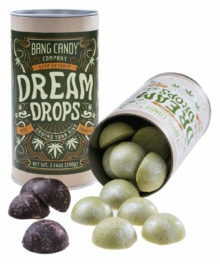 They’re puffy enough to be fun yet durable enough to survive use in a kid’s room (or around office mates who want to cuddle with your new friend). This puppy is available in two colors. Question: Will I ever need to change the bulb? 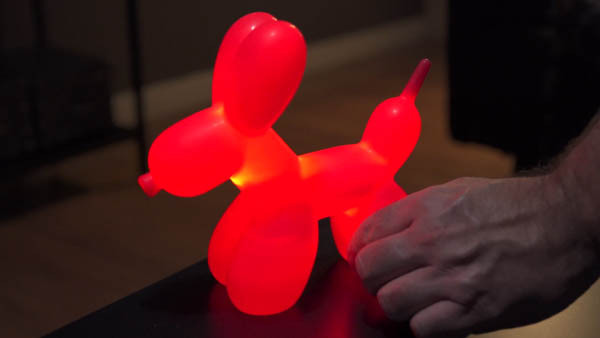 Answer: The Balloon Dog Light uses an LED light so you shouldn’t have to replace it. 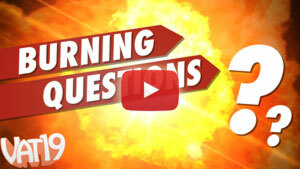 Question: Does it feel like a balloon? 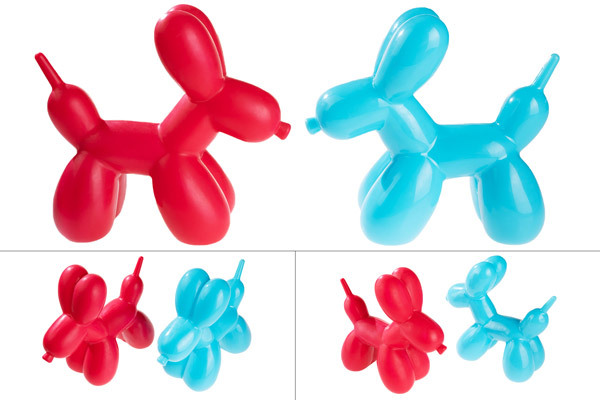 Answer: The Balloon Dog Light is made of silicone rubber, so it feels closer to hard plastic.